PROSODOL project aimed to study the effect of OMW disposal on soil and to address negative effects by introducing and demonstrating innovative methodologies for soil quality protection and improvement as well as, by developing a strategy for continuous soil monitoring that will ensure sustainable soil use. Development and dissemination of innovative, environment friendly, low cost technologies for the protection of soil and water pollution from olive oil mills’ wastes. Establishment of an info-library/knowledge-base system to assess environmental impacts from olive oil mills’ wastes to Mediterranean region. Facilitate the implementation of Soil Thematic Strategy in areas close to olive oil mills. Design, implementation and support a monitoring system for the assessment of the soil and water quality affected directly or indirectly from oil mills’ activities in relation to factors pressures and responses. Identification of potential safest uses in the agricultural sector of olive oil mills’ wastes and its possible contribution to agricultural production. All foresaw activities were implemented at two demonstration-pilot areas; one in Greece and one in Italy. The Greek demonstration area is located in the Μunicipality of Rethymnon (former Municipality of Nikiforos Fokas), in Crete. The selected pilot municipality is one of the many municipalities in Greece, but also in Mediterranean, facing the same problem of the uncontrolled disposal of untreated olive mills wastes. Five olive oil mills are in function in the selected pilot area for more than 10 years, whereas there are also two more mills that have stopped their activities before almost 10 years. Some of the active mills use evaporation ponds, while other dispose their wastes directly on soil, in rivers and streams. During the past years no detailed study had been carried out in the region but also in the neighbouring municipalities to evaluate the quality of soil and water resources and the way that mills’ activities affect the surrounding environment. The second implementation site of the project was set up in Liguria Region, Italy where young olive trees were grown under controlled conditions and with the addition of specific amounts of OMWs during experimentations aiming to the identification of the optimum conditions for OMW use at olive trees orchards. As regards the potential threats for soil quality due to the uncontrolled disposal of OMW, it was deduced that risk for soils in OMW disposal and neighbouring areas is high since a number of soil parameters exceeded normal, high or toxic thresholds. It was also revealed that there are some soil properties that protect soils from degradation; clayey soils have very strong adsorption capacity and may remove big percentages of phenols and other contaminants after one application of OMW. However, this capacity is substantially reduced though after additional applications increasing thus contaminant concentration in infiltrating leachates and thus risk for deeper soil horizons overloading and groundwater contamination, as well. Consequently, higher risk is anticipated if disposal of OMW takes place on soils poor in clay and CaCO3 and with low pH, on soils close to the sea or other water resources and if groundwater table is shallow. The obtained results highlighted the need for establishing soil quality standards for some soil parameters in order to declare soils affected by induced human pollution like disposal of OMW. There is strong indication that the long-term application of OMW has the potential to induce soil or groundwater contamination. Therefore, long-term use of OMW requires monitoring to assess any risk of environmental pollution. PROSODOL proposes a set of eight soil parameters that can be used as soil indicators specific for OMW disposal areas, i.e. organic matter, electrical conductivity, total nitrogen, total polyphenols, available phosphorous, exchangeable potassium, available iron and pH (mainly for acid soils). In order to assess the risk for water bodies at areas close to OMW disposal ponds, a carefully designed water monitoring strategy was implemented in the project area and water samples were collected every 2 months for all the four years of the project from surface streams, springs, water supply pipes, old wells, existing water abstraction wells and from piezometers installed in 5 drillholes (1 of these was used as control) in the wider affected area. Results revealed that the risk for groundwater is highly depended on the soil type, the presence of limestones and the depth of groundwater table. Moreover, the presence of clays in soils reduces substantially the toxic load during infiltration. It is anticipated that any impacts in the OMW disposal areas will affect mainly recipients at local scale. In case though of more intense activities, larger affected areas and different soil qualities (e.g. sandy soil) risk for humans and ecosystems will be much higher. 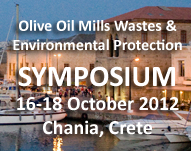 It is therefore proposed that due to scattering of olive oil production units in the Med region, simple and cost effective measures should be considered including neutralization and/or dilution of OMW prior to disposal in ponds or on agricultural soils as well as, construction of impermeable evaporation ponds; in the latter case geo-membranes or alternatively clayey soils may be considered as a cheaper option. Having performed thorough studies on soil quality and its dependence on OMW disposal in the framework of PROSODOL project and considering the specific climatic conditions of the Mediterranean countries, it is recommended that a monitoring tool fully suited to OMW disposal areas should include: (1) an optimized set of soil quality indicators; (2) threshold values for soil quality indicators; (3) a system that enhances decision making regarding the most appropriate location for OMW disposal according to certain criteria (4) a system that enhances decision making regarding the suitability of soil for OMW disposal/application (i.e. a land application system) to ensure safe disposal/use/application of OMW on soil in the Mediterranean region; (5) guidelines for periodical soil quality monitoring; (6) software application tools for soil monitoring that will facilitate adoption of the monitoring system by authorities and individuals; (7) guidelines for periodical water bodies monitoring; and (8) a code of good practices for soil management. One of the main project’s objectives was to develop and implement cost effective soil remedial actions that will remediate or, at least, protect soils from further degradation. It should be, however, highlighted that the development and implementation of soil remedial actions, appropriate and specific for OMW disposal areas, have been never implemented and demonstrated before and thus, the selection among available soil remedial methodologies was not existed as an option and, most significant, there was no possibility to compare the obtained results with results obtained from other already implemented and demonstrated methods. Therefore, all potentially applicable soil remedial methods were recorded and evaluated. It was, however, clear that a soil remediation and protection plan suitable for OMW disposal areas, should include methodologies for polyphenols reduction and retention or immobilization of inorganic constituents. Therefore, for the reduction of polyphenols concentration in soil, in situ-bioremediation was selected since it targets to the biodegradation of organic pollutants in soil by taking full advantages of the natural biodegradation process of organic molecules by soil microorganisms. For the reduction of inorganic soil constituents, the use of natural zeolite, clinoptilolite, as soil additive was considered the most suitable for this case because of the already well-known properties of natural zeolites to attract, retain and slowly release many inorganic cations, such as K+, Na+, Fe3+, Cu2+ and others. Moreover, the method is of very low cost and very easy to be implemented, even by no qualified personnel. The two methodologies applied at a pilot disposal area and the results obtained were very much satisfactory, indicating that these methods could efficiently be used for soil improvement and protection from the disposal of OMW. Field pilot-composting was implemented during the PROSODOL project using as raw materials solid OMW (i.e. sludge from inside the evaporation ponds), straw, caw manure, fresh and dry leaves, and different ratios of zeolite dust (0.00-0.80mm). After the evaluation of the results and the chemical analysis of the composts the most appropriate composition was selected and proposed. PROSODOL focused also on the development and demonstration of low-cost OMW pre-treatment techniques with the use of various reactive agents. These reagents were used to remove solids, add alkalinity, remove some of the toxic load and degrade organic contaminants so that the main treatment that follows becomes easier or disposal to land as fertilizer is feasible. Various materials were used in lab scale in pre-treatment experiments to investigate sorption of organic contaminants, increase pH, initiate precipitation of metals in stable forms and/or remove solids from OMW. Most of these materials are low cost, by-products of other processes and are abundant in Mediterranean countries. For the pre-treatment of OMW the materials used include magnesite by-products, natural zeolite, limestone, two different types of soils, goat manure (GOM), zero-valent iron (ZVI) and activated carbon (AC). GOM and ZVI show promising results in terms of phenol removal and pH increase. The investigation of the potential impacts of OMWs used for olive trees irrigation/fertilization on soil quality and the potential contribution to yield increase were studied at a pilot orchard for two years. For this, field trials were performed in Albenga, Italy, during which controlled distribution of OMWW and husk took place in a pilot olive orchard. A pilot scale experimentation site of around 1.500 m2 for the controlled use of OMWW for tree land fertilization was set up and almost 200 two-years-old olive tree plants belonging to 3 different varieties (Taggiasca, Pignola, Leccino) were transplanted. OMWW and husk were distributed and the impacts on soil quality, on leachates quality and on yield were recorded and evaluated. Finally, a fast and easy methodology was developed for the measurement of wastes’ COD and BOD5 at mill level. For the integration of PROSODOL activities, an extensive analysis of European Union legislative framework on the subject of olive oil waste management was performed, including the relevant regulations of waste, water and soil. The analysis integrated the relevant legislative framework of the partner countries, i.e. Italy, Spain and Greece as well as of Portugal and Cyprus, as well. In specific, the study includes (a) an analysis of the olive oil industry and the relevant environmental issues; (b) waste management and the relevant EU and national legislation on waste, water and soil; (c) legislative recommendations for olive oil waste management, both statutory and volunteer; (d) legislative recommendations as well as technical specifications and proposed strategies to monitor, protect and improve soil quality at olive oil mills’ disposal areas. For the promotion of soil protective and remedial actions at OMW disposal areas, PROSODOL proposes a set of recommendations to be included in the national/European legislative frameworks. The recommendation are those derived after evaluation of the project’s outcomes and mainly from the soil monitoring actions performed at olive mills waste disposal areas, and their fulfilment is considered necessary for soil quality protection. It is believed that their incorporation as Member States’ obligations in the legislative framework of the EC or/and of the Med Member States will ensure future effective monitoring of the legal and illegal disposal areas, which in turn will facilitate the sustainable management of these areas. Moreover, PROSODOL proposes a set of technical standards which could be utilized either as Best Available Techniques for Soil Monitoring and Soil Quality Improvement or as Annexes in future Directives and legislative acts, which will assist national local/regional/governmental authorities to implement strategies to monitor, protect and improve soil quality at olive oil mills’ waste disposal areas. Category B: Simplified texts/Guides/manuals for stakeholders/policy makers which were printed and distributed.